I did some thinking this week in the wake of the loss of two of Boston’s Bravest, Michael Kennedy and Edward Walsh and it is a point that I think the world commonly over looks when it comes to police, fire, and EMS. We have to deal with death far too often most of the time in the form of the general public and the patients that many of us encounter in the streets. Death is never an easy thing to digest in any setting but we push on, despite it sometimes being a child, or maybe a scenario that is all too familiar to us that triggers some sort of memory from our own personal past. We are there to deal with it though, and we are there to help the survivors through the early stages of their loss. The truck stays in service, and we are ready for the next call. We are not afforded the luxuries that many other people get. If the person who died owned a business for example, that business might close its doors the day of their funeral to allow their employees to pay their respects. The employers of their loved ones most likely will give them the day off so that they can properly mourn their loss in their own way. When it comes to public safety though, there is no day off. There are no locks on the doors or a sign that we can put up in the window that says “be back in 15!” that expects people to be patient and await the return of someone, anyone who might be working that day. Firefighter Kennedy and Lieutenant Walsh were lost on Wednesday March 26th. On Thursday morning March 27th, there was a group of brave responders who despite their loss put their own grief on the back burner every time the tones dropped because somebody needs them. The magnitude of that seemed to hit me today as I read through the outpouring of support for Boston Fire over the last couple of days. When the Springfield Police Department tragically lost Kevin Ambrose on June 4, 2012, I was working. I was on the call. I can almost guarantee that the call affected every single one of my twenty-plus crews on the street that day. I know it affected me personally. I can’t begin to imagine what Kevin’s brothers and sisters in blue were going through. Despite it all though, we all had to push on. There were calls that needed to be answered. There were people that needed us. Our own personal feelings about that day had to be pushed to the back burner and dealt with later. That’s not an easy thing for anyone to do, but we had to do it. Any loss is serious to someone, and the fact that these two men were firefighters might not gauge the loss at the same magnitude to everyone and that is fine, but to credit those who stepped up on March 27th and the days since, I think we need to recognize their resilience. Despite their need to mourn and their desire to recognize the men that they lost they had to do it while the alarms were still coming in, and the medical calls were still being dispatched. They had to do it with the knowledge that the next dispatch could be one identical to the one at 298 Beacon St and they had to be ready to charge head first into danger because that’s what they are expected to do. To the men and women of Boston Fire, thank you for all you do, and take care of each other. 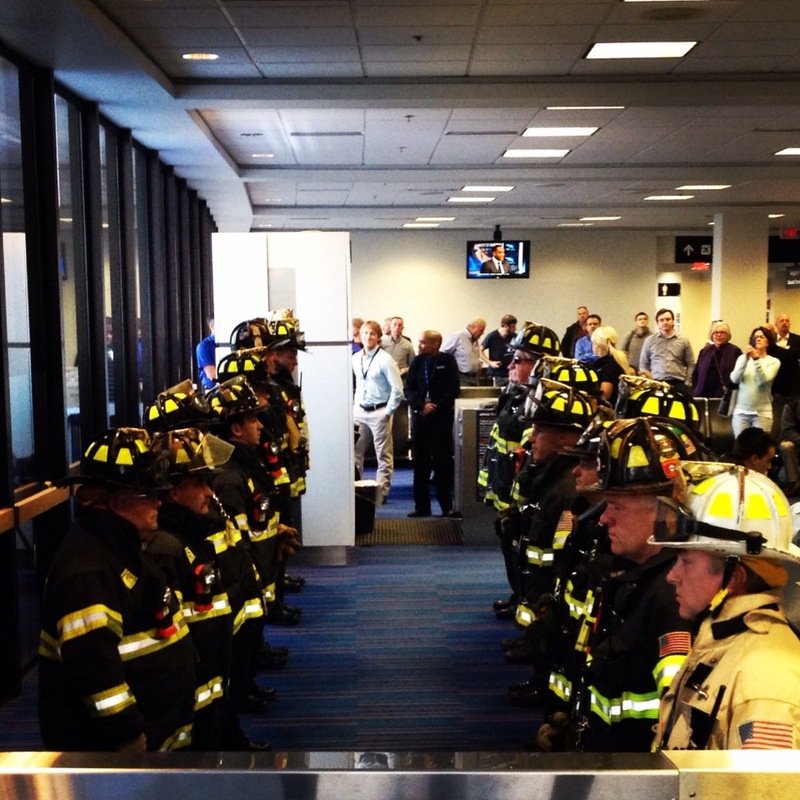 A group of Boston’s Bravest wait at Logan Airport to greet the mother of one of their fallen brothers from Wednesday’s tragic fire.